In Hollander's God Will Provide the Lamb, we see a parallel between the near sacrifice of Isaac by his father Abraham. God used this event to test Abraham's faith and obedience; the angel of the Lord commanded Abraham not to sacrifice his son for he passed God's test. God subsequently provided a ram for the sacrifice, for one became entangled in the bushes near the altar. 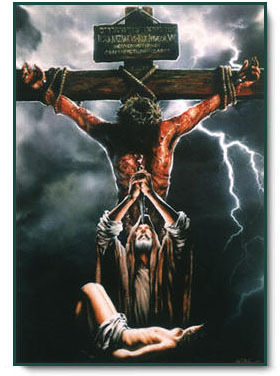 We also see the sacrifice of Jesus on the cross as the Lamb of God taking away our sins. God Will Provide the Lamb copyright © 1998 by Erik Hollander.